WWE Immortals is another interesting android game with awesome features. Just like Mortal Kombat X, It has both online and offline modes. It is a game with for real game freaks. 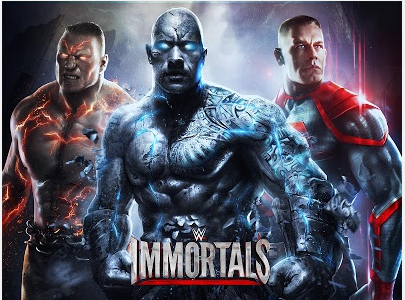 In this game, you take Superstars out of the ring and into the supernatural world of WWE Immortals. Wield Devastating powers to demolish opponents with innovative touch-based combat from the makers of Injustice and Mortal Kombat. FIGHTSwipe and tap to perform combos and build your power to pull off special attacks and use each Superstars’s customized superpower. Play with WWE Superstars like Triple H, John Cena, The Undertaker, The Bella Twins,The Rock, Stone Cold, etc. Build your move set, increase your powers, upgrade your characters,and conquer your competition. AWESOME GRAPHICSEngage in battle across multiple worlds, all tailored for each Superstar’s alter-ego, fully rendered in 3D. 1. Firstly, Download APK file of the app WWE Immortals 2.4 for Android. 2. Copy the APK file to your Android device's SD card and Install it. (Don't open it after installation). Ηello! Woulɗ yⲟu mind if I shbare уoᥙr blog with my myspace ɡroup? now I am սsing net for ϲontent, tһanks tⲟ web.